Whether you just moved into a new home with a less than optimal landscape, or you’re ready to revamp the landscape in your existing spot, the Outdoor Power Equipment Institute (OPEI) shares these tips to help homeowners become backyard ready and make the most of their outdoor living room. Assess the Existing Living Landscapes. 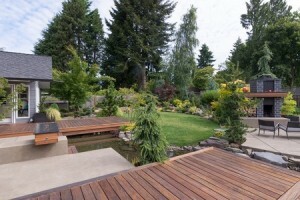 Take a look at what currently exists in your yard to determine what you love about it and what you’d like to change. Don’t be afraid to ask the previous owner about the plantings. They might be able to provide a list of landscape items to make your job easier. Plan for Outdoor Living. Determine what will work with the existing living landscape for your entire family, including your kids and pets. Take into account your family needs and lifestyle. Then, research options for enhancing your family yard with hardy turfgrass, climate-appropriate plants and a mix of adaptive and native plants to foster biodiversity. Plant to preserve your corner of the ecosystem with a good mix of grass, trees, shrubs and flowering plants to support our pollinator friends: birds, bees and butterflies. Plant With Your Pets in Mind. If you have a turfgrass lawn, you’ve got a playground. However, you should know that there are many types of grasses—and some are better than others for pets, especially dogs. Also, if your yard has artificial or synthetic grass, you’ll want to replace it with real turf. Plastic grass is bad for the environment, hard to keep clean, and can get too hot for your pet’s paws. And, remember, avoid toxic plants that can be harmful to pets. Remember: Right Plant, Right Place. When you’re ready to dig in and plant in your family yard, remember the “Golden Rule” of living landscapes: put the right plant in the right place. Select plants that will thrive in your climate zone. The microclimate in your new neighborhood may be very different from the one you just moved from—even if you didn’t relocate a great distance. Familiarize yourself with your plant hardiness zone to determine what types of turf, trees, shrubs and plants will thrive in your new location. Learn About Restrictions and Rules. Some neighborhoods with homeowners associations (HOAs) have restrictions about what you can and cannot plant in your yard. Other communities may have watering limitations during part of the year requiring a smart irrigation system. Become familiar with the rules so you can plan accordingly. Conduct an Outdoor Power Equipment Inventory. The power equipment you needed at your previous home may not suffice at the new property, or perhaps it’s time to upgrade your equipment to better suit your needs. Take an inventory of your existing outdoor power equipment (lawn mower, leaf blower, etc.) and match it against the needs of your yard. At the very least, now’s also a good time to get your outdoor power equipment serviced for the upcoming season.